Polygon Group works with real estate damage, with focus on damages caused by water, and has offices across Europe. 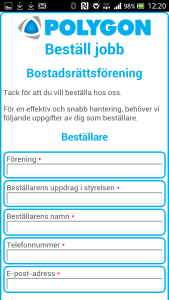 Specifically Polygon Sverige AB uses a solution from Abiro AB for ordering of jobs via mobile phones. The solution is a combination of CliqTags, where information and order forms reside, and on top of that apps for iOS and Android that encapsulate the functionality, so that the user gets an app experience. Orders are aggregated in CliqTags, partitioned on company, commune and private customers, and responses can be viewed directly in CliqTags and be downloaded for further processing. Also, an assigned contact person gets an e-mail when an order is made, for quick processing. This was complemented with instructions, company and contact information. All was achieved with existing functionality in CliqTags. The solution has been very successful, without any incidents, and thousands of orders have been made since the start Autumn 2015. The business was set up as a turnkey offering, consisting of a complete solution with full responsibility for availability for fixed price and yearly maintenance fee, and additional work was performed on hourly basis. The customer has its own account, but so far all content editing has been performed by Abiro.